Invisalign Braces from only £63.01* per month. Book your free consultation with us today. 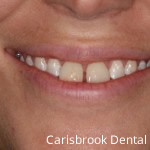 At Carisbrook Dental, based in Manchester, we have specialist Orthodontic Dentists available to discuss your orthodontic options with you. We have a range of treatments available to help straighten your teeth or correct your bite problem, including Invisalign. Invisalign is one of our most popular orthodontic treatments as it is an ‘invisible’ way of correcting your teeth and is also removable for cleaning. Invisible – The Invisalign system is an ‘invisible’ solution because the aligners are transparent and most people will not notice them, meaning that you can confidently smile throughout your treatment as well as after. Removable – The Invisalign system can be removed to eat and drink and to be cleaned. This can help you maintain your dental hygiene throughout your treatment. Comfortable – Traditional braces can irritate your gums and teeth due to the metal wires and bands whereas the Invisalign system is comfortable to wear avoiding such irritation. You can see it working – Invisalign has it’s own computer system which allows you to access your virtual treatment plan, see how your teeth will move over time and see how they will look after treatment. Proven – The Invisalign system has been proven in both practice throughout the world and in clinical research. Each new aligner you use will move your teeth further until they have straightened and sit in their final position. You will need to visit your dentist or orthodontics specialist every 6 weeks to ensure that your treatment is progressing as planned. 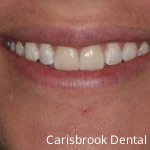 At Carisbrook Dental we offer a number of removable invisible braces including Clear Braces and Invisalign. 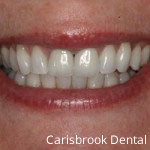 Invisible Braces are an ideal choice for both adults and teenagers as it removes the embarrassment of wearing braces whilst achieving the smile you are looking for. If you are looking for fixed invisible braces our Manchester based team are trained to fit iBraces (incognito braces). iBraces are the only 100% customisable fixed system that is invisible. iBraces combine the flexibility and power of traditional wired braces with the aesthetics of invisible braces. iBraces also overcome some of the problems that traditional fixed braces can cause, such as, patient discomfort, bracket placement difficulty and wire bending. 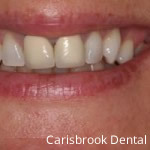 If you would like to discuss how Carisbrook Dental can help you with your dental needs please call us today on, 0161 766 4906. We also offer an emergency dentistry service. If you find that you need an emergency dentist please contact us on 0161 766 4906.